Bridgeport Paving has been providing a host of quality paving services for over 40 years. 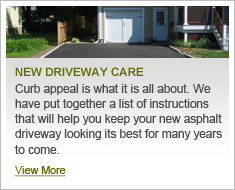 Thanks to hard work combined with personal understanding of our clients’ needs we have grown to become the premier installer on virtually every type of project, ranging from asphalt paving, concrete work, excavation, drainage, utility and general contracting work in the Fairfield and New Haven Counties. Through it all, we have maintained the same recipe for success: family values and commitment to exceptional quality and service. Our goal is to provide expert service at cost-effective pricing to our customers. To give our clients the competetive rates they demand and improve our enviornment, we reclaim the pavements we remove from our work sites and reuse it as gravel. We are well versed with all town requirements and hold licenses, bonds and insurance in all towns we do business in, including a state license. We operate out of a large centralized facility that is staffed with the most skilled and highly professional workmen in the industry and house and store our own equipment that can satisfy not only your paving, but all your construction needs.